Travel Guide: A Day Trip to Ko Tao and Ko Nang Yuan from Ko Samui and Ko Pha Ngan — Blake Erik. Ko Samui offers plenty of day trip options, and often these day trips are the iconic images of Thailand that come to mind. Because of this, thousands of day trippers land on these shores, and besides Ang Thong Marine National Park, Ko Tao and Ko Nang Yuan is another popular itinerary for many travellers. Located north west of the bigger islands of Ko Samui and Ko Pha Ngan where most travellers will be based, though there's accommodation on the smaller islands too; the trip to Ko Tao and Ko Nang Yuan takes one and a half hours by speedboat in the open sea. Like with my guide chronicling the experience to Ang Thong Marine National Park, first covered will be practical information including how to get there, how to arrange tours, various fees and such, before concluding with what we did and our actual experience on the ground. Many tour operators who organise day trips to Ang Thong Marine National Park are likely to offer an itinerary to Ko Tao and Ko Nang Yuan too, which was what I saw in the brochures for all three tour operators the front desk staff at the resort we stayed in Ko Samui recommended. We, too booked our tour through our resort, and two of the companies they offered operated a speedboat, and the last on a slower boat. For what we booked and paid (with charges posted to our room bill so we didn't pay upfront), it included pick up to and from our hotel by minibus which was like our trip to Ang Thong the day before; clean, timely and efficient. The ฿1, 900 tour also included a light breakfast— think a couple of bananas, juices, coffee and tea rather than anything substantial or appetising, but again, this wasn't a problem for us as we had breakfast included at our resort. We booked our tour with a company called Lomlahkkhirin, which I was happy with the service of. A tour leader you meet at check-in at the counters at the pier, bring you onboard and act as tour guides for the rest of the day, and everyone we had with us was enthusiastic and friendly. I was told that if I booked a tour directly with the company it would've cost me ฿1, 800 to ฿1, 900, so much to my surprise, the savings wouldn't have been substantial if I made the extra effort to seek out a tour company myself and book directly with them. However, this was the price we paid in June, which is considered to not be the high season, which starts in July to September, and picks up once again in November and December, where I was informed the same tour would cost ฿2, 500. We were picked up via minibus at 8am after breakfast, where the driver made another stop at another nearby hotel to pick up other passengers before ferrying us to Lomprayah Samui Maenam (Pralan Pier). 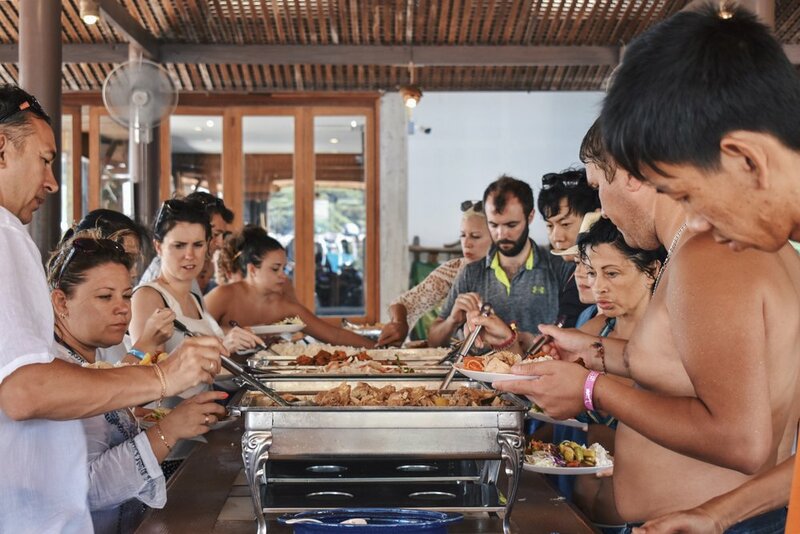 As mentioned, once at the pier, you're redirected to the counters to register all your guests by name to collect a wristband so you're easily identifiable throughout the day by your tour company, and to ensure all guests are covered under insurance. We waited till around 9am, where we were gathered by our tour leader for the day and got on board where the boat headed to Ko Pha Ngan to fill up the other seats on the boat. Mind, seats fill up to the brim, but we had no trouble getting seats for 5 the day before the trip at about 7pm. Our first stop was Ko Tao, where we never stepped on the island, but rather to jump off the boat to snorkel. Ko Tao's Lighthouse Bay is a sheltered bay with calm, clear waters. My experience the day before with snorkelling at Ang Thong Marine National Park was not great, there weren't very many fish, plenty of sea urchins everywhere, the water was cloudy, and there were tons of fellow daytrippers snorkelling in the waters. However, I did mention in my post for Ang Thong that a reason for the waters was because it had rained the day before, washing a lot of sediments into the waters. However, speaking to the tour leader, he mentioned snorkelling in Ko Tao in general is better, and better it was. Yes, there were still a little too many people in the waters for my comfort, but the water here was crystal clear, and the fish didn't seem to mind the sheer number of people in the waters, swimming right up and around us. Our tour leader was kind enough to take over our GoPro and managed to get some properly stunning footage of the fish and marine life. We had an hour here and I enjoyed snorkelling here, though I should probably mention I still think my experience in the Flores Sea in Indonesia was better. But the lack of other people around and it being a more undiscovered and less travelled area means better quality of life underwater for the marine life anyway, so the corals were stunning and full of life, but slightly barren and bleached in a lot of this part of Thailand. After snorkelling, a short hop over to Ko Nang Yuan, where we'd spend the rest of the trip on brought us to our lunch buffet. Unlike my experience at Ang Thong Marine National Park, where we were joined only by another boat load of travellers, literally everyone was here in Ko Nang Yuan, so many travellers had to be squeezed in with other travellers at the same table in the restaurant. I will say though, food here was better, perhaps because their kitchen seemed a lot more well-equipped to deal with the sheer number of mouths to feed. I wrote that the food at Ang Thong wasn't great, and it was more food for sustenance rather than world-class Thai cuisine, and though the buffet here's more well-appointed, I'd still extend the same thought here. After lunch, we were given free time, a total of slightly more than 2 hours, where we could either hike up the viewpoint, go snorkelling at the Japanese Gardens, or simply relax on the beach and go for a swim, before regrouping at the restaurant premises at 2:30pm where we would head back to Ko Pha Ngan and Ko Samui. We chose to hike up the viewpoint first, where you follow a wooden walkway around the island before ascending a stairway up in the woods. The hike wasn't as taxing as the hiking at Ang Thong, because this viewpoint isn't as high or as winding or as steep, but it still takes someone with a decent level of fitness to continuously climb up a seemingly never-ending flight of stairs in the tropical humidity. I did this hike in flip flops too, and while I wish I had shoes at Ang Thong, doing this in flip flops was perfectly fine. At the top of the stairs though, it gave way to natural rocks, meaning getting around and up was a bit of a squeeze with other travellers trying to get down, and getting up to the highest rocks meant actual rock climbing and some proper upper body strength to lift yourself up these rocks. Still, teamwork makes the dream work, and other travellers are always willing to land a helping hand to help support you up. After, we headed back down to the beach and straight to the beach bar for a drink, the only one serving all the tourists around. We walked over to the Japanese Garden, which was nothing more than a shallow bay of water once again overcrowded by the sheer number of tourists so I chose to just swim and stay at the beach instead. By this time, every single tour company had landed on the island, so if I could find a beach chair or ten in the morning, by the afternoon, they'd been all snatched up. We eventually headed back when it was time, and went back on the boat and headed back to Ko Pha Ngan and Ko Samui. Back on Ko Samui, we arrived at about 4 in the evening, where we were told our minibus number for pick up and the parking lot back at the same pier we first left from in the morning, and headed back to our resort. Unlike Ang Thong which is a protected national park, there weren't any additional fees to pay here. A common complaint about these day trips usually reads something along the lines of, "it was beautiful, shame about everyone else," and while I didn't feel the full brunt of this at Ang Thong, perhaps because different tour companies occupy different islands at different times of day, there was nowhere else to go on this day trip beyond the two islands advertised, meaning I completely understood where everyone else was coming from. Still, I'd highly recommend doing this trip too, as it really was stunning on a clear, sunny day. These tour operators and boat crew could do these trips in their sleep, meaning there were no hiccups and help provide travellers with a fantastic experience within their capacity. If it's privacy and a feeling like you're the only one in your own slice of paradise you're after, this isn't the place to provide that experience for you, but if you're just after a good time on some beautiful islands, this will more than suffice.